St. Petersburg, Florida (January 28, 2016) — On Friday, January 29, Englander Fischer will be joining artists and other supporters of the local arts community as a sponsor of the Third Annual St. Petersburg MUSE Awards, an annual fundraising event for the St. Petersburg Arts Alliance. This year’s awards recognize Visual Artist Steven Kenney and Ya Levy La’Ford as Arts Ambassador. 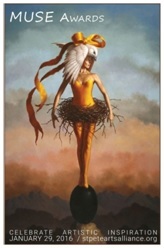 Kenney’s work “The Pinnacle” has been chosen for the poster commemorating the event, which takes place at the St. Petersburg Museum of Fine Arts. The evening will include pop-up performances, dance, music, artful by-the bite dinner courses and curated auction items. Englander Fischer founding partner Leonard S. Englander will be presenting the Muse Patron of the Arts Award to the J. Crayton Pruitt Foundation at the event, in recognition of the Foundation’s contribution to the Warehouse Arts District Association Arts Exchange. “MUSE recognizes the breadth and beauty of arts and culture in St. Petersburg, and honors the ‘Muses’ who continue to inspire and guide our city to its standing as an international arts destination,” said John Collins, Executive Director of the St. Petersburg Arts Alliance. For more information, visit www.stpeteartsalliance.org/muse.